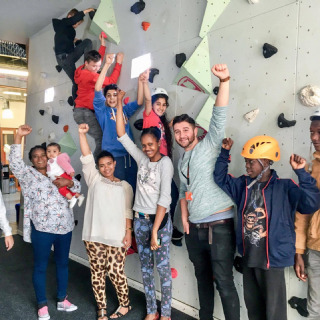 “As part of our Summer Social Activity Programme, I was super happy to accompany 12 of our Centre Users along to the Orange Box to take part in numerous activities. We were warmly welcomed by Jamie who was wonderful in accommodating us from the start. Following registration, and after Jamie had wowed everybody with his karaoke skills, Jamie took our families for a full tour of the facilities. The children, most of whom had never visited before were completely awe struck! We were then shown the rehearsal rooms, in one end we see a dance group practising their impressive routines and then lots of huge inflatable zorb balls whizzing up and down the length of the rooms, and much to our amusement these zorb balls contained young people in hysterics with laughter! Our Centre Users giggled, another one to try out after the tour! The media suite was next, filled to the brim with musical instruments, all of which were sampled with excited giggles by our families, they loved banging on the drums and tinkling along soft notes on the piano. We were then led to the art rooms where an upcycling workshop was taking place, teenagers and young people speckled with dashes of colourful paints were proud to show us their creations, chairs painted with flowers, stars or footballs ready to take home for their rooms at the end of the day. A real sense of achievement glistened in their eyes. Sarah the interior designer was kind enough to give our youngest group member of a tiny four months old, a wooden trolley to keep her toys and teddies inside, we all laughed as mum placed baby inside for a ride.